PBS DOCUMENTARY IN THE WORKS! Two weeks ago, Chuck Zboril , and Gerald Blaine were interviewed for a documentary being produced by the PBS for the Tampa area. 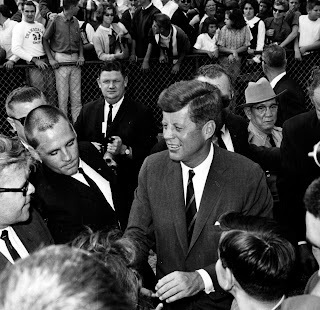 The subject is President Kennedy’s trip to Tampa four days before his assassination. The documentary should be excellent and is a very positive one endorsed by the past and present mayor. PBS is very appreciative of their appearance. The last two days have been very busy. A TV Crew from Berlin, Germany flew into Grand Junction to interview Jerry regarding the Kennedy administration. documentary focused specifically on his visit to Berlin. Win Lawson and Gerald Blaine are the two surviving agents who made that trip. Win did the advance and Jerry was in the motorcade. 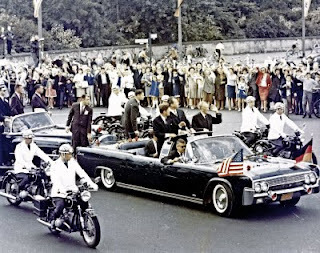 The trip to Berlin was undoubtedly the highlight of President Kennedy’s administration. This second documentary will focus on President Kennedy and his administration. The documentary is being produced by ARD German Television.